How many kits do I need for my car? 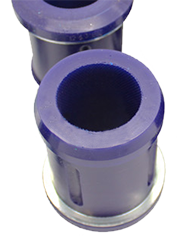 Is it possible to fit SuperPro Polyurethane Bushes for racing and motorsport applications? Do you sell uprated SuperPro bushes for motorsport? For each location on the vehicle, a SuperPro kit supplied contains the necessary parts to replace both sides of the car. All SuperPro bushes can be fitted with normal workshop tools and equipment. Grease is supplied with every kit where necessary for effective operation and will also help fitment. Please click here for fitting instrcuctions. In normal use you should expect SuperPro to last 5 to 6 times longer than the original rubber component. However, as polyurethane does not acquire a "Set" in the same way as rubber, nor is it affected by contaminants such as ultraviolet light, oil, petrol, diesel, salt, water, hydraulic fluid etc, it can in fact last considerably longer. No. Colour coding by material hardness would result in us either specifying multi-coloured car kits of varying hardness of material, or kits of one colour of the same material hardness that would offer a compromised result to our customers. SuperPro believes that it is important to supply a bush that is designed to achieve the optimum performance for its location on the car. This means that a single car may need bushes of three or four different hardness's of material to deliver the best improvement in suspension performance without creating excessive levels of NVH. Yes 3 years or 60,000 Km. Yes, SuperPro can offer far increased handling performance over rubber. It is especially beneficial where a car will continue to be used on the road as well as in competition, and where nylon or rose joints are not appropriate. Given the superior performance and durability of SuperPro, we recommend that standard bushes will give you outstanding results in most applications. If after fitment and testing you are looking for even greater performance we can look at uprated bushes.